Sen Gary Peters (left) tours the Tiara Yachts factory in Holland, Mich., with David Slikkers. 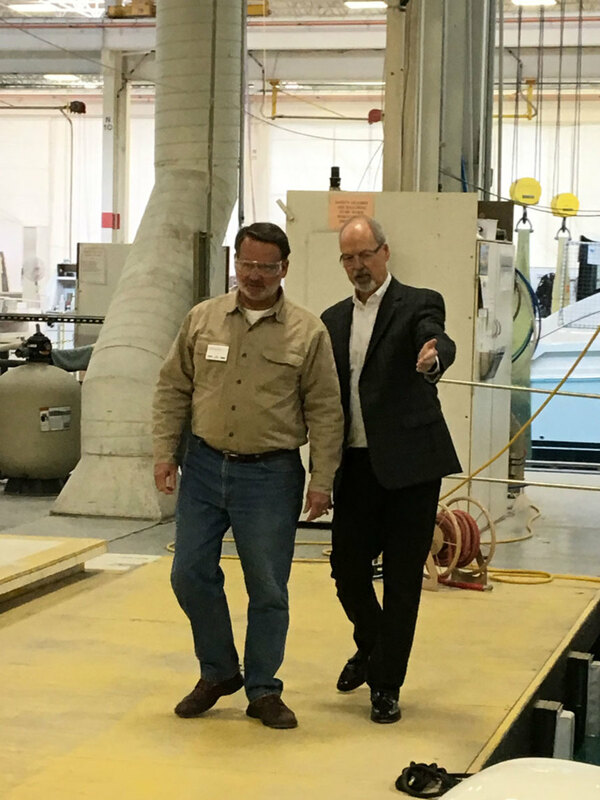 Sen. Gary Peters, D-Mich., toured the Tiara Yachts headquarters in Holland, Mich., to meet the workers and learn about the impact of the company on the local economy, as well as the impact of boating on a state and national level. The senator, who was invited by Tiara and the National Marine Manufacturers Association, met with parent company Tiara Yachts former CEO David Slikkers to learn about some of the top policy issues affecting boaters in the state, including aquatic invasive species, infrastructure and boating safety. As a member of the Senate Commerce committee, Sen. Peters has been instrumental in moving forward the Modern Fish Act with bipartisan support, and officially became a co-sponsor of the bill following his tour at Tiara Yachts — a move the NMMA is calling a victory for the industry. The NMMA emphasized the connection between boating and saltwater fishing, even in landlocked states. Though built in a state surrounded by freshwater, boats like Tiara are used by saltwater anglers along the U.S. coasts, and policies impacting fishing can have a direct link to marine manufacturers across the country, the NMMA said. The Modern Fish Act increases fishing access and conservation, modernizes fisheries management, and improves data collection for the 11 million saltwater anglers.